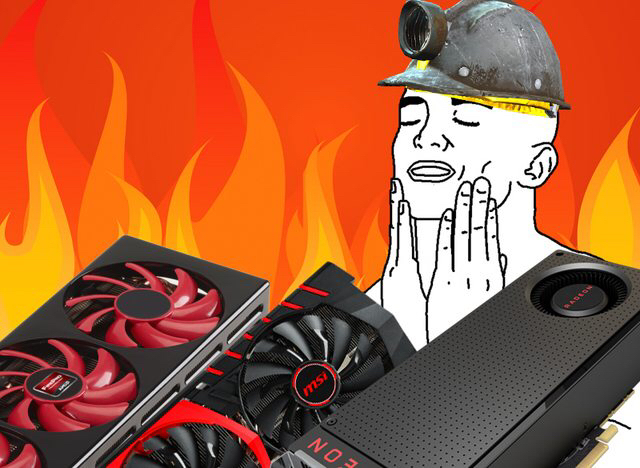 PC gaming enthusiasts will one day look back on July of 2017 and say, “There were certainly better times to buy a GPU.” Roughly six weeks have passed since the price of the popular cryptocurrency Ethereum spiked to new heights and threw the gaming GPU market into disarray. While demand on mid-range GPUs from both AMD and NVIDIA has rendered their retail availability practically nonexistent, the high-end enthusiast GPU segment had remained mostly unaffected. I first covered the Ethereum mining boom’s fallout just last week and mentioned that the dwindling supply of GPUs for PC gamers to buy was mostly limited to mid-range parts. In the short time since that piece was published, many graphics cards featuring NVIDIA’s GTX 1080 GPU have vanished from some online retailers. The few remaining cards still for sale directly from popular retailers NewEgg and Amazon have seen prices increase as much as 20 percent since last week. Pricing on stock available from resellers on those sites can be even higher. The GTX 1080 launched at a suggested retail price of $599 ($699 for the Founder Edition variants) back in the summer of 2016. It received a price cut to $499 when NVIDIA revealed its ultra high-end GTX 1080 Ti back in February. Since that time, a wide assortment of cards from NVIDIA’s AIB partners have been available with some of the cards selling for as low as $430 up through the middle of June. As of this writing, the cheapest offering from NewEgg is an EVGA custom card for $569. It, along with a different EVGA GTX 1080 at $589, were the only remaining air-cooled cards still available for under $600. Most of the cards listed are out of stock and a few popular models, like the MSI Gaming and ASUS Strix, were absent from the page altogether. At the previously mentioned GTX 1080 Ti launch, NVIDIA also revealed that a newer revision of its GTX 1060 and GTX 1080 GPUs would soon be available using upgraded memory. Several of these newer edition GTX 1080s have been available for months and were identifiable by their 11Gbps memory spec. 2 of those cards remain for sale on NewEgg, but start at $629 (a price listed as a limited time sale). NVIDIA’s announcement of the upgraded GPUs did not clarify if the original GPUs were to be phased out or if they were meant to exist alongside the new variants. AMD is expected to announce its long-awaited competitor to the GTX 1080/1080 Ti at the upcoming SIGGRAPH conference in Los Angeles. Before the official reveal, AMD is showing off the new RX Vega GPUs at a few limited engagements across the globe. Unit pricing and the number of RX Vega cards available at launch is still unknown. An influx of new GPUs would be a welcome sight for PC gamers enduring this summer of GPU madness, but there is no guarantee that what AMD has on hand will make things better or worse for the erratic GPU market. Have you been trying to buy a video card lately? Are you waiting for Vega or for the first regular-priced GPU that comes back in stock? Let us know by clicking below and join the Chatty conversation. Man, crabs, I dunno. I've got a 8gb 480 right now and there's nothing it struggles with. Probably 4-5 years away from needing something new unless there's a huge advance that requires upgrading. Yeah, but 8GB RX 480s sell for ~$400 right now if you can find one in stock. For folks that had not recently upgraded or needed a new GPU, spending the extra $50 or so dollars to move up to the 1080 was a good deal, considering it was often twice as fast as the 480s in many cases. That is what most folks did. Then they bought all the 1070s. Now those are gone and 1080s are almost gone, too. Struggles being cool. The original Fermi grill yeah? This situation is 100% Crabs fault. His article last week let the cat out of the bag. This week all the cards are gone. Next week all the ethereum coins will be all mined out. Then we can all buy used 1080's on eBay. I wonder if my 1080 next year will be a good sell. Keep on mining! Can you actually mine and make money if you have a 1080? What should I mine? Am I reading this properly? The profit is a couple $ per day? I bought a EVGA 1080 Classified for $549 a few weeks ago. I even got a free copy of Destiny 2 with it so I think I got a pretty good deal. It would appear you did get a nice deal. That card is now $609 on NewEgg. I believe my video card was starting to flake out recently, but there were no new cards that I could afford on a budget. I was luck that Wadmaasi sold me his used 980 Ti for $200, to finance his upgrade to a 1080 Ti, because I didn't really have (m)any other viable options. There's no way I'd spend more than $300 video card, even if it was NIB. Yeah, I think he had offered it up to at least one Shacker before I jumped on it. I haven't found anything near that price for any card as good as what I got. Still seems very curious the 1080 stock is faltering or even wondering if it isn't a fluke right now. I was looking last night with a friend who is considering picking up a VR headset and we did find a few in the mid 500-range. eVGA had several deals on B-stock units for $430-450 with 1 year warranty. I wonder if NVIDIA and their board partners are running the channel lean in anticipation of the rumored pascal refresh. Everybody, knock this mining crap off. I'm going to need a new card to drive this $400 Rift and I refuse to pay double MSRP. You don't need a 1080 anymore for the Rift. With their ATW drivers a 1050 is plenty enough. Some people even get by with a 970..